Today the word fetish has many connotations. Here it means “spiritual amulet”. In making a fetish carving the artist experiences a connection between himself and the animal. 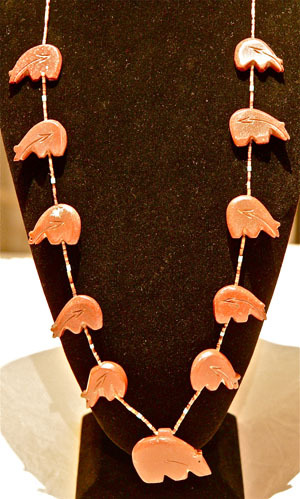 A personal connection with nature and with art is an integral part of the Zuni religion. They believe the elements of nature, including all the animals around us, are sources of spiritual guidance and inspiration. A stone that appears to be in the shape of a bear may hold the energy of "bear spirit". Holding or wearing such a stone brings that energy closer to us. Traditionally, the artist carves the stone in order to bring out the spirit that already resides there, honoring the nature of the animal. The "heart line" of inlaid stone or silver that sometimes appears from the mouth to the heart/lung area of an animal symbolizes the breath or life energy. A small bundle or arrowhead tied to its back with sinew or beading cord is an offering to that animal. Examine them and you will sense the inner life that makes each miniature sculpture unique. It is as if they speak to us, or come alive in the night.